Last major update issued on August 20, 2006 at 05:25 UTC. The geomagnetic field was quiet to major storm on August 19. Solar wind speed ranged between 343 and 506 km/s (all day average 426 km/s - increasing 64 km/s over the previous day). While SOHO did not record a solar wind shock, ACE data indicate that the leading front of a CME passed by a few minutes before 11h UTC. This was likely the arrival of the large CME observed on August 16. Solar flux measured at 20h UTC on 2.8 GHz was 88.8. The planetary A index was 38 (STAR Ap - based on the mean of three hour interval ap indices: 38.4). Three hour interval K indices: 21126665 (planetary), 21235455 (Boulder). Region 10904 decayed further and lost penumbra on the trailing spots. There is still a small chance of an M class flare. 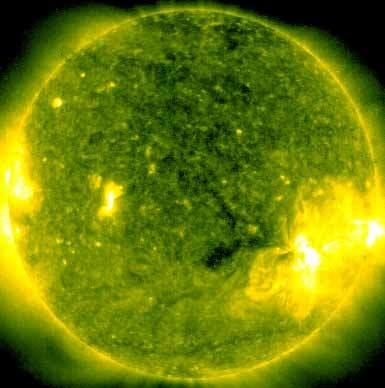 Flares: C3.8 at 11:24 and C2.2 at 21:19 UTC. August 17-19: No partly or fully Earth directed CMEs were detected in LASCO imagery. A small coronal hole in the southern hemisphere was probably located just too far to the south to be geoeffective, it rotated across the central meridian on August 18. 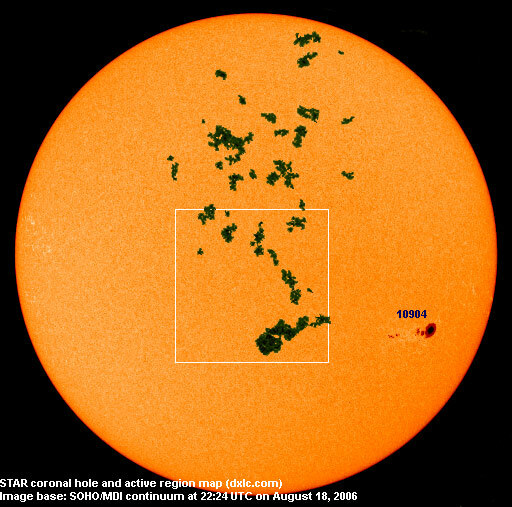 The geomagnetic field is expected to be quiet to major storm on August 20 and quiet to unsettled on August 21-22. Long distance low and medium frequency (below 2 MHz) propagation along east-west paths over high and upper middle latitudes is very poor. 1510 WWZN was noted with a weak signal at LSR as the only station from North America. Propagation on long distance northeast-southwest paths is fair.While there weren't many stations from Argentina and Uruguay audible, a number of stations from Brazil had good signals. 1560 and 1570 kHz both had several stations from Brazil during the hour after LSR.